Spanish architect Rafael Moneo is one of five 2017 Praemium Imperiale laureates, an annual prize of 15 million yen (approximately $136,000) given by The Japan Art Association. The other winners are performer Mikhail Baryshnikov, Senegalese world music star Youssou N’Dour, as well as Iranian video artist Shirin Neshat and Ghanaian sculptor El Anatsui. At a ceremony in Tokyo on October 18, His Imperial Highness Prince Hitachi, honorary patron of the Japan Art Association, will present each laureate with a specially-designed gold medal. At the announcement at The Juilliard School in Manhattan on September 12th, author and critic Paul Goldberger gave a short speech reflecting on Moneo’s long career, which includes completed buildings such as the National Museum of Roman Art(1986) in Merida, Spain, the Madrid Atocha Railway Station (1992), the Cathedral of Our Lady of the Angels (2002) in Los Angeles, and the Prado Museum Extension (2007), as well as awards including the Pritzker Architecture Prize (1996) and the RIBA Royal Gold Medal (2003). 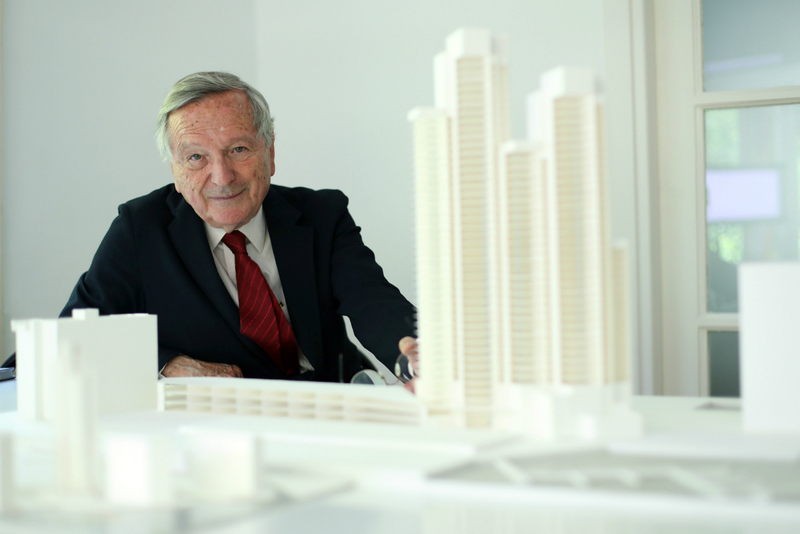 “It is with great pleasure that we announce that the Praemium Imperiale Prize in Architecture will go to Rafael Moneo of Spain. Moneo is based in Madrid, but he is very much an architect of the world. For many years he headed the architecture program at Harvard, and he has designed numerous buildings in the United States, including the monumental Cathedral of Our Lady of the Angeles in Los Angeles. I vividly recall his very first American building, the Davis Museum at Wellesley College, of 1994, which called to mind the work of Louis Kahn, and helped establish Moneo as an architect capable of strong, brooding, sensitive buildings that were powerful objects in themselves, but also comfortable neighbors to very different kinds of architecture. It was a particular challenge here because the new building was just beside a much-admired building by Paul Rudolph, a great architect whose work is not particularly easy to be adjacent to. That is a particular problem in architecture: the past is not only an idea that an architect must deal with psychologically and creatively but in any kind of urban or campus setting it is also a physical presence he or she must in some way acknowledge. This is especially important to Rafael Moneo: he insists that his work at once be distinctive and be part of a larger historical continuity. He does not want to design buildings that look like older ones, but neither does he want to design buildings that look as if the older ones were not there, and had not had an impact on him. He is incapable of designing in a vacuum; his starting point is always what is there, which he then uses to create something we have never seen before. His National Museum of Roman Art in Merida, Spain, of 1986, a magnificent essay in brick arches, both honors the Roman tradition and moves beyond it. His expansion of the Prado in his home city of Madrid, like the Davis Museum, deals with the deep challenge of making the new be and feel new while at the same time acknowledging and being connected to the old. Rafael Moneo is an architect of sensitivity and strength, of sanctuary and serenity, and in his best works these qualities are not oppositional but reinforce each other to create objects of lasting beauty that speak to the spirit of our time, and beyond." Past winners of the prize include Ingmar Bergman, Leonard Bernstein, Peter Brook, Anthony Caro, Christo and Jeanne-Claude, Norman Foster, Jean-Luc Godard, Willem de Kooning, Akira Kurosawa, Arthur Miller, Seiji Ozawa, Renzo Piano, Robert Rauschenberg, Mstislav Rostropovich, Ravi Shankar, Cindy Sherman, and Stephen Sondheim. "Once I learned of some of the other people who had won the prize, I felt so satisfied to think I will be among so many great people," Moneo told AN.